Welcome! River Bends Psychology, LLC is owned and operated Leah Crouch, Psy.D. 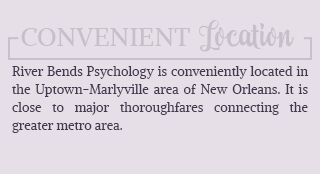 Dr. Crouch is a clinical psychologist serving the Greater New Orleans metro area. Dr. Crouch received her master’s and doctorate in clinical psychology from the University of Denver, Graduate School of Professional Psychology. She has experience working in outpatient clinics, academics, and forensic settings. Dr. Crouch he has held positions in both state and federal government, including Louisiana State University Health Science Center and the Department of Defense. Currently, Dr. Crouch is affiliated with Tulane University, Department of Psychiatry and Behavioral Sciences. 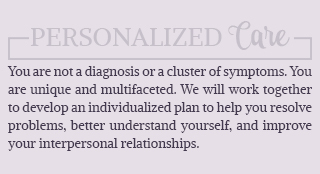 Dr. Crouch has specialized training in clinical and forensic psychology as well as trauma related issues. Dr. Crouch has worked with adults, including but not limited to civilians, veterans, and active duty service members, in the public and private sector providing a range of psychological interventions. Dr. Crouch looks forward to meeting and working with you to make the changes you want to make! 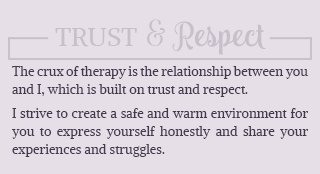 People enter therapy for many reasons. I believe that you are the expert about your life, but there are obstacles in your way hindering you to live with life you want. You may find yourself struggling with life transitions, trauma related issues, relationship problems, identity issues, depression, anxiety, or you may want space to talk and get to know yourself better. Please contact River Bends Psychology for more information. I provide individual case and ongoing professional consultation services for other licensed mental health providers. I provide supervision to psychology post-doctorates and psychiatry residents training in psychotherapy. I also teach didactics within the psychology division at Tulane University, Department of Psychiatry and Behavioral Sciences. Although I do not accept insurance or belong to any insurance panels, I will readily provide you statements for you to submit to your insurance carrier to file for out of network benefits. Please note that reimbursement is dependent on your insurance carrier and coverage. Please contact your insurance carrier for details. Click below for a list of questions that you will want to ask your insurance carrier. Forensic psychology consultation is also available. Please contact me for more information.